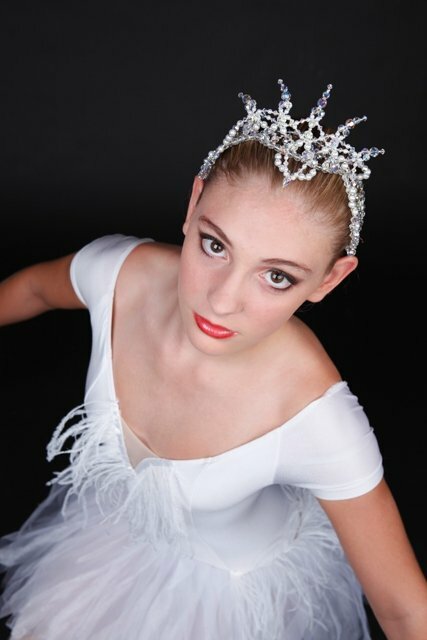 Brand New - Swan Lake (Odile and Odette) Ballet tiaras, handmade using the finest Swarovski Crystal and perfect shiny glass pearls. Prince Siegfried finds himself a peaceful spot by an enchanted lake where swans gently float across its surface. He spots the most beautiful swan with a crown on its head. As dusk falls, the swan with the crown turns into the most beautiful young woman he has ever seen. Her name is Odette, the Swan Queen. The Prince, about to confess his love for her, is quickly interrupted by the evil sorcerer. He takes Odette from Prince Siegfried’s embrace and commands all of the swan maidens to dance upon the lake and its shore so that the prince cannot chase them. The next day at the formal celebration in the Royal Hall, Prince Siegfried cannot stop thinking about Odette. His mother commands him to choose a bride, but he cannot. Von Rothbart brings his daughter, Odile, on whom he has cast a spell to appear as Odette. The prince is captivated by her beauty as he dances with the imposter. Unbeknownst to Prince Siegfried, the true Odette is watching him from a window. The prince soon confesses his love to Odile, thinking that she is Odette. To Odette’s horror, she flees into the night. Prince Siegfried sees the real Odette fleeing from the window and realizes his mistake. Odette has fled back to the lake and joined the rest of the girls in sadness. He explains to Odette the trickery of Von Rothbart and she grants him her forgiveness. Von Rothbart tells the prince that he must stick to his word and marry his daughter. Prince Siegfried tells Von Rothbart that he would rather die with Odette than to marry Odile. He then takes Odette’s hand and together they jump into the lake, the spell is broken and the remaining swans turn back into humans. They quickly drive Von Rothbart and Odile into the water where they, too, drown. The girls watch the spirits of Prince Siegfried and Odette ascend into the heavens above Swan Lake.